Newtab.review is the PUP that uses misleading techniques to prevent removal. Use Reimage to locate malicious components and get rid of them faster than with uninstall instructions. A full system scan blocks virus reappearance and prevents traffic to malicious domains. 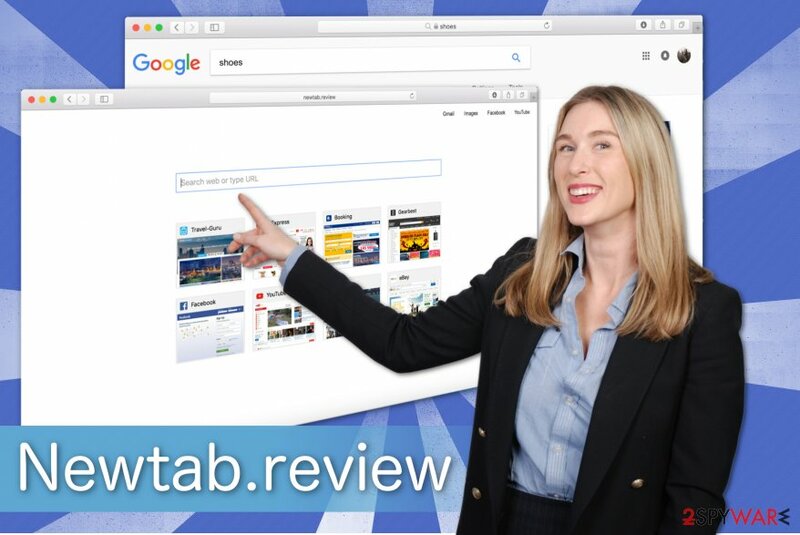 Newtab.review is a fraudulent search directory which promises to enhance user's browsing experience. Even though it claims to deliver relevant search results quickly, these are only empty promises to trick gullible people trusting its services. Note that there are similar potentially unwanted programs such as Newtab.today, Newtab.club, and all of them are categorized as browser hijackers. Newtab.review search engine falls into this category since it is able to perform specific browser modifications once on the system. It sets itself as a primary search provider and changes your new tab URL, homepage, and default search engine to http://newtab.review. Unfortunately, the user is unable to reset these options and get rid of the browser hijacker. If that is not enough, in spite of Newtab.review hijack, you will also be traced during your browsing sessions. This potentially unwanted program places tracking Cookies to collect various information about its users. The gathered details might include personally identifiable and non-identifiable data like IP address, geolocation, name, email, etc. This data collection might not only put your privacy at risk but also help the developers gain more pay-per-click revenue. It is because they alter the delivered search results to look more attractive by using the records. As a result, you are more likely to click on the sponsored websites and help benefit the developers of Newtab.review. Newtab.review operates as a fake search engine and delivers distorted search results. However, it is essential to understand that Newtab.review redirect tendency might be dangerous. It delivers tons of online ads which might promote unreliable content including malware. Therefore, any clicks on banners, in-texts, or pop-ups might trigger an automatic installation of other high-risk computer threats. Likewise, we suggest you remove Newtab.review with a reputable security software. Our recommendation would be Reimage since it is easy to use and finish the elimination procedure within seconds. However, if you have another reliable antivirus tool, feel free to get help from it as well. Those who prefer to finish Newtab.review removal themselves should follow the instructions below. They will not only show you how to get rid of the browser hijacker but also reset Internet Explorer, Google Chrome, Mozilla Firefox and many other browsers to the primary stage. While many might think that the potentially unwanted programs are remotely infiltrated on the system, it is not true. Typically, they reach computers in software-bundles which refers to the installation of the additional applications while installing regular ones. Note that this distribution method is completely legal, yet unfair from the standpoint of the computer user. Since developers do not inform about the installation of the browser hijacker once the person chooses Quick or Recommended settings, he or she often is unable to decline that. Therefore, you should always opt for Custom or Advanced ones. These parameters will disclose the checkmarks which permit to infiltrate various potentially unwanted programs on your PC. Do not forget to de-select them and double-check your system for PUPs with a professional antivirus application. As we have already mentioned, you can either remove Newtab.review automatically with a reliable security software, or use the manual elimination guide below. However, note that the former method is far more convenient since you will only need to download the anti-malware application and let it scan your system thoroughly. If you decide to complete Newtab.review removal manually, we kindly advise you to read the instructions attentively. According to SenzaVirus.it unsuccessful elimination might occur due to the misinterpretation of the guide or a tendency to skip steps. Thus, we ask you to be careful. Here, look for Newtab.review or any other recently installed suspicious programs. Wait until you see Applications folder and look for Newtab.review or any other suspicious programs on it. Now right click on every of such entries and select Move to Trash. When in the new window, check Delete personal settings and select Reset again to complete Newtab.review removal. Once these steps are finished, Newtab.review should be removed from your Microsoft Edge browser. You should delete all suspicious entries to fix Mozilla and eliminate Newtab.review from your system. Here, select Newtab.review and other questionable plugins. Click Remove to delete these entries. Now you will see Reset Firefox to its default state message with Reset Firefox button. Click this button for several times and complete Newtab.review removal. Here, select Newtab.review and other malicious plugins and select trash icon to delete these entries. Click Reset to confirm this action and complete Newtab.review removal. 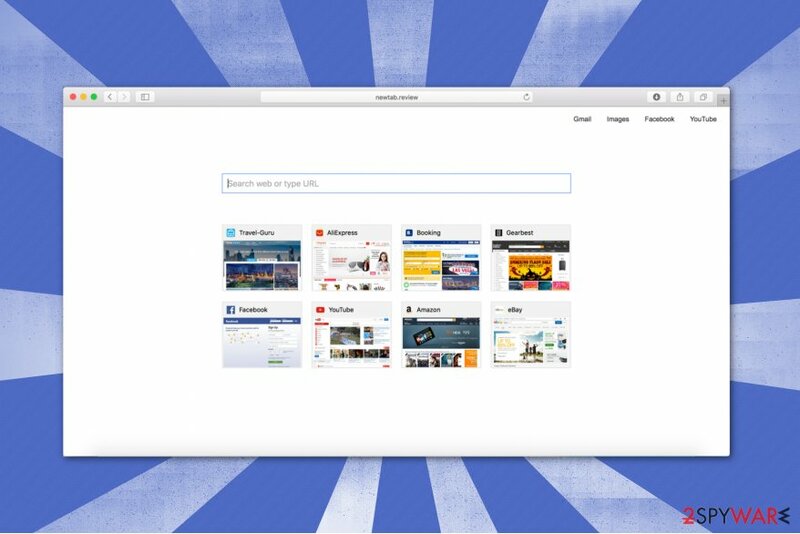 Here, select Extensions and look for Newtab.review or other suspicious entries. Click on the Uninstall button to get rid each of them. Here, look at the Homepage field. If it was altered by Newtab.review, remove unwanted link and enter the one that you want to use for your searches. Remember to include the "http://" before typing in the address of the page. Now you will see a detailed dialog window filled with reset options. All of those options are usually checked, but you can specify which of them you want to reset. Click the Reset button to complete Newtab.review removal process. 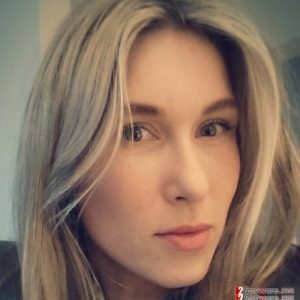 This entry was posted on 2017-12-28 at 03:33 and is filed under Stealing programs, Viruses. You can quickly scan the QR code with your mobile device and have Newtab.review manual removal instructions right in your pocket. How did you remove Newtab.review?